Patrick Stephenson came to Operation 36 Golf Academies when we weren’t even called that. At the time we were called The Edge Junior Golf Programs. We were running 7-10 year old classes and 10-13 year olds classes at the time. His father was looking for a fitness coach and after spending a few minutes on the range with him, I thought we could offer him both fitness help and a swing coach. We decided to start a High School class right then and there and rounded up 3 other players in the area. The ironic thing as we look back at that original High School class, we had 1 player end up playing golf at Clemson’s PGA Golf Management Program, 1 played Division I golf at Campbell University and Patrick is currently playing Division I golf at East Carolina University. What a start to a high school program! Patrick had some amazing ability and determination before he even stepped foot on Keith Hills and started working with our staff. He would work extremely hard at everything we discussed both on the fitness side and on the golf side. He was determined to play high level college golf and nothing was going to stop him. We as coaches were along for the ride. My fondest memory with Patrick among many was on the back 9 of the US Amateur Qualifier at Keith Hills in July of 2014. Our coaches at iGrow were following him around the front 9 and he wasn’t playing great. His dad thought Patrick needed a jolt so he came over to me and asked me to take the bag for the back 9. Sitting in the fairway on 18 he had no choice but to pull 3 wood and hit it as hard as he could. His 15 foot eagle putt found the bottom of the cup and he qualified at the age of 14 for the US Amateur at the Atlanta Athletic Club. Patrick competed alongside future PGA tour players Bryson Dechambeau, Ollie Schniederjans, Jon Rahm and some of the best college players in the nation. What a cool experience! We are very fortunate at Keith Hills that Patrick comes back and helps coach some of our classes. Many of our juniors look up to him as a role model and hero. 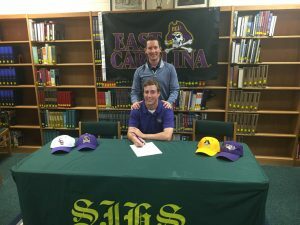 Patrick currently is enrolled at East Carolina University and playing on a golf scholarship. In his freshman campaign, he qualified to play in every fall and spring match. The highlight of his freshman year was a 68 in round 2 of the Mountain Intercollegiate and a 69 in round 1 of the Hayt. He had the lowest score for the team in the Mountain Intercollegiate and the Hayt. He finished in 9th place at the Mountain Intercollegiate.